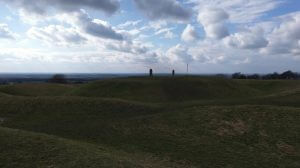 I managed a kid-free trip to the Hill of Tara over Easter and I loved it. 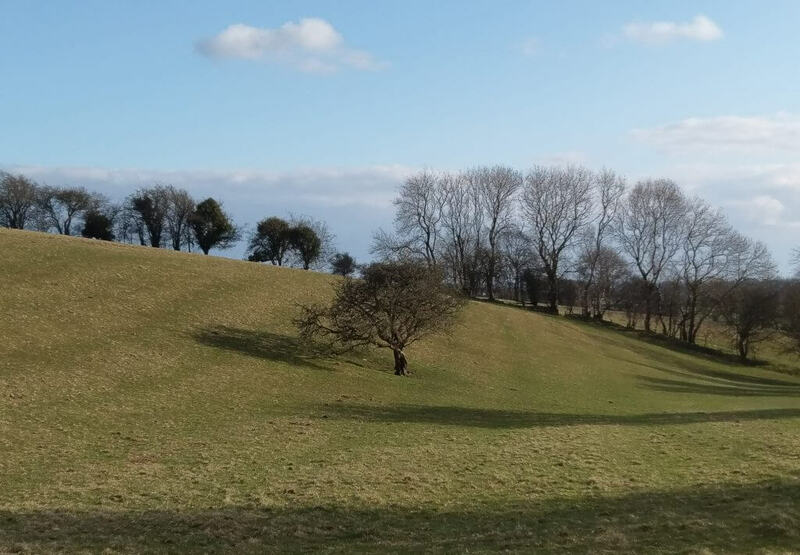 Given the many stories about Tara and it being the place where the High Kings of Ireland lived and the old stories that link it to the Ark of the Covenant, it amazes me that so much of the landscape of Tara has yet to be excavated. 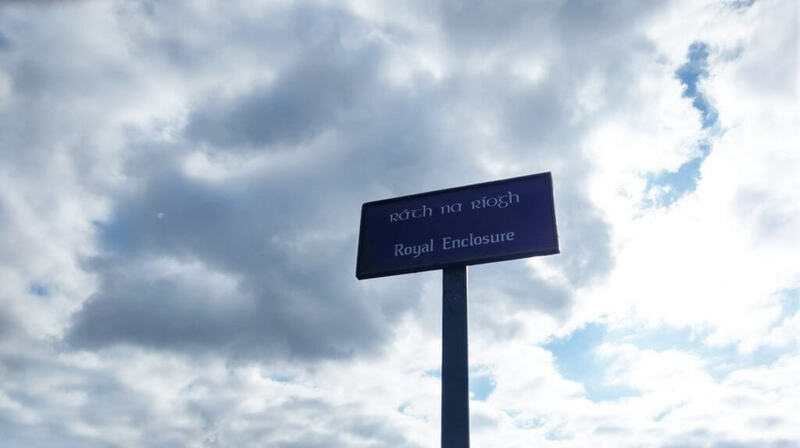 Tara is on our doorstep and yet, like many of the places tourists flock to in Ireland, many of us haven’t had the chance to experience the wonder of what is a part of our heritage. For those of you that don’t know much about Tara, it was the chief pagan sanctuary of early Ireland and hosted many a ceremony and burial. 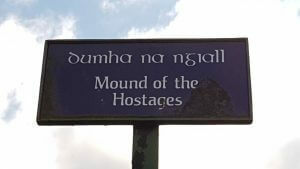 Tara’s role as a place of burial began in the late 4th millenium BC (before Christ) when a passage tomb, Dumha na nGiall (Mound of the Hostages pictured below along with the prehistoric artwork inside! ), was built on the hill and lasted for over 3 more millenia! Generation after generation left their mark on Tara. 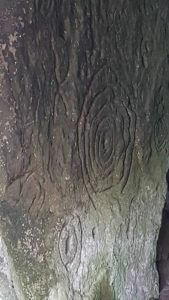 It is likely that the large processional avenue called Tech Midchúarta and the ceremonial enclosure called Rath Maeve date from the end of the Stone Age. 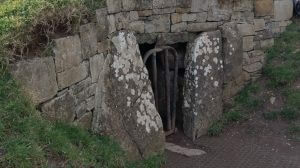 Tara also has burial places that date from the Bronze Age and the Iron Age. Over time the importance of Tara increased; to be crowned King of Tara was to also be accepted as being crowned King of Ireland. We had a wonderful guide Treasa from Sacred Sites tell us stories that have been handed down over time. The magical stories of Cormac Mac Art, Fionn Mc Cumhaill, Gráinne and Diarmuid all added to the overall experience. I found the many mounds really spectacular and felt the kids would have loved to be running up and down them. However, there were two things that really stood out for me. The first was the Lia Fáil (Stone of Destiny), a stone pillar that stands at the centre of the Forrad and is associated with the inauguration of the Kings of Tara. 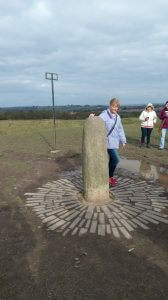 Legend has it that if you go around the stone 3 times with your eyes closed (not as easy as it sounds!!) and make a wish, that the wish will come true. So I had to give it a whirl! I was so focussed on not falling, I nearly forgot to make a wish. The second and most impressive thing for me was a TREE (not a big surprise to any of you that know I’m obsessed with trees) but this was not just any tree. It was a FAIRY TREE!! The guide gave the Sígh an offering for us to be able to go close to the tree. We each asked the tree permission to place a small clottie around a part of the tree. The clottie is meant to symbolise something that we would like to be rid of. Tradition has it that when the clottie flies off the tree, you’ll be rid of whatever it is you wanted to be rid of. I’ll keep you posted!! But all in all a wonderful day out with or without kids and it was just wonderful to connect with my two favourity things: nature and heritage. This entry was posted in Heritage and tagged cormac mac art, heritage, high king of ireland, hill of tara, nature, tracy gilbert, Tracy Gilbert Designs.